Imagine you are walking down a dark ally, and someone suddenly appears out of nowhere with a boring-colored mask over their whole face! It would be very alarming and threatening, and you'd probably book it out of there as fast as you could. Now take that same scenario, but this time, the dude that jumps out at you is wearing a bright red mask over just their eyes. If it were us, we'd still be alarmed, but also probably feel more confused than in danger. We would just be waiting for them to shout "Have no fear, good citizen! ", before sprinting off into the night. 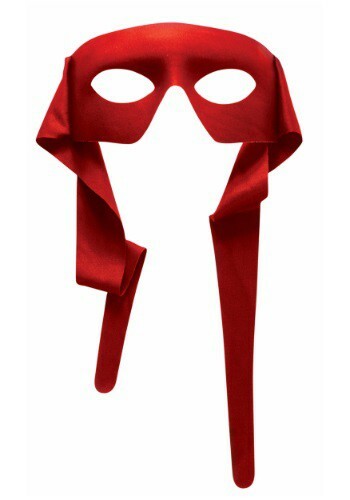 If you want to run around in a mask, while giving off more of a heroic flair rather than a nefarious vibe, try this Red Masked Man accessory on for size. The mask portion is molded polyester material to help keep its shape, and the cloth ties allow for more flexible fitting. This dashing disguise looks great with any red-themed costumes requiring secrecy, or for any other daily masked antics!